oder z.B. 24 Raten à 70,00 € mit der 0% Finanzierung! The Series M2 embraces three models the M2-9, and M2-12 offering pivot-stylus dimensions covering virtually all turntable requirements. A collet of ingenious design affords ‘one-piece’ rigidity and allows azimuth correction to be made before final tightening. 1.0 gram per revolution tungsten weight sub-graduated 0.25 and 0.025 gram moving on a precision screw with backlash eliminator. 220mm (48”) D501 balanced audio lead. Engineered in the best camera quality with satin chrome finish Fluid damped lift/lower control. Geometry optimised for Ø300mm (12”) LPs. Low friction, fully shielded races for both axes. Phono plugs and other contacts heavily gold plated. Pressure die-cast magnesium headshell with unique collet. Sliding base for tracking adjustment. 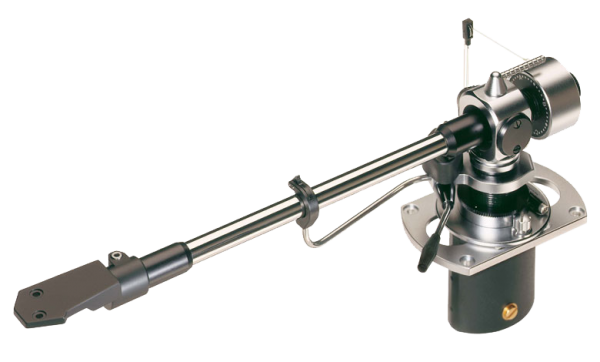 Thin-walled stainless steel tonearm with internal damping. Weiterführende Links zu "SME Tonarm Series M2"
Kundenbewertungen für "SME Tonarm Series M2"